While some of the Chinese born in the 1970s and 80s grew up learning Western instruments, such as the piano and violin, nowadays studying such instruments are much more commonplace among both adults and children. Another Western originated skill, equestrian sports or horseback riding, is the new trendy hobby. "Even though they like animals, children who live in cities do not have a lot of opportunities to be around animals, except for going to the zoo," said Sun Wenxin, who is the mother of a five-year-old girl and lives in Beijing. Her daughter, Doudou, started training at a local equestrian club about a year ago. But she is not the youngest beginner in her club. Quite a few of the children there started their horseback riding classes at just three years old. Wang, a father of two boys, has registered both of his sons for equestrian classes. His eldest son is six and joined the club three years ago. Now, his three-year-old sibling is following in his footsteps. "As kids, we learned instruments like the guitar. It was hard to find a horse back then," Wang explained. He said, originally, he was just looking for a sports class for his son but then thought he would give horseback riding a try. "It turned out that my son enjoyed horseback riding a lot. So, we continued," he said. "What I care about the most is that through horseback riding, a child's willpower, tenderness and strength can be cultivated." 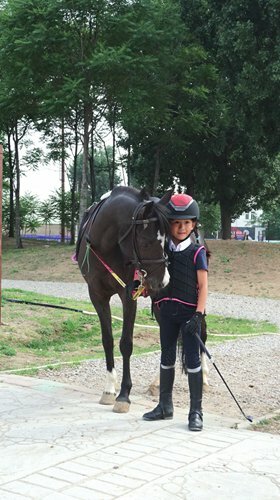 Wei Ningyuan is learning horseback riding with her six-year-old daughter. She chose horseback riding because it is closer to nature, which is "better than indoor sports activities." "It makes children more open," she said. Even though the Chinese started raising and riding horses for living and war purposes more than 2,000 years ago, it is very different from the current trend, which originated in Europe. 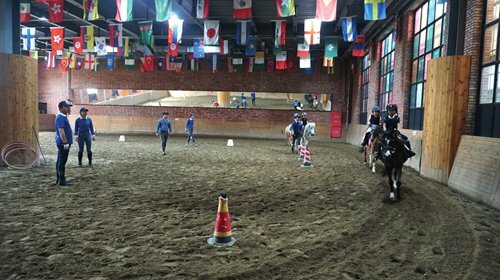 Equestrian sports entered the Chinese mainland in the 1980s, but it was not until the last decade or so that the number of learners began to rise significantly. According to a China Sports Daily report in 2017, the number of equestrian clubs in China was less than 100 in the 1980s. But since 2008, both the number of equestrian clubs and horseback riding enthusiasts saw a 100 percent annual increase, and as of 2017, the number of equestrian clubs in China stood at more than 1,400, the report said. Chen Che, secretary general of the Beijing Turf and Equestrian Association, explained that while equestrian training on the Chinese mainland in the 1980s was mainly due to the government's desire to increase participation in the Olympics Games, recent years' development is more due to market demand. One important reason for the change in the number of horseback riding enthusiasts is the rising disposable income of Chinese families. With a more significant disposable income, more people can afford to take horseback riding lessons and even compete locally. According to a report in Oriental Outlook magazine, statistics collected by the National Bureau of Statistics of China show that in 1995, the average annual income per person was 5,500 yuan ($863.02). At that time, violin or piano class cost about 50 yuan per hour. The 2017 annual income statistics from the bureau show each person earning 61,578 yuan per annum, which means there is a lot more money to afford horseback riding classes at between 300 yuan and 400 yuan per 45-minute class. "I think that is acceptable," Sun told Metropolitan. "Classes like English language training can be as much as 200 yuan, and they are not one-on-one and do not include an animal." Wei shares a similar sentiment. "It is more expensive than similar classes in the US, but in Beijing, it is a reasonable cost," Wei said. Chen said another reason more people may be trying horseback riding has to do with the perception that equestrian sports were only for rich people or European aristocrats. He said now that more Chinese families can afford the activity, they want to experience it. However, for him, the sports' ability to teach riders self-discipline and a greater appreciation for animals far outweigh the need to sample something that was previously out of reach. "In Europe and the US, it is competitions that push the development of the equestrian industry, but in China, it is cultivating one's mind that attracts more and more people to the sport," Chen said. Dong Yanli, head coach at the Beijing-based Ipony International Youth Cavaliers Academy has a similar opinion. He said besides riding courses, stable management is also an important aspect of training in China. "It helps children learn to work with their hands and establish a loving feeling toward animals," Dong explained. "I like it a lot because you get to be with animals and play with animals and get exercise," said 11-year-old British-Chinese Constance Hu, who has five classes three days a week. Hu used to like the feeling of the wind blowing over her as she rides her horse. Now, her favorite activity is jumping, and she plans to represent China on the equestrian team at the Olympic Games. Acknowledging that falling off the horse and getting hurt may be a big concern for many parents, Constance's mom, Amy Loveday-Hu, said the risk is minimal and a child could just as easily get hurt crossing the road or driving in a car. So, as a parent, her job is to make sure her daughter gets proper protective gear and replace them as soon as they wear out or get damaged. "I come from a family that likes horses and also rugby, and both of those sports can get quite rough," she laughed. "If you are happy doing it, it's a calculated risk." 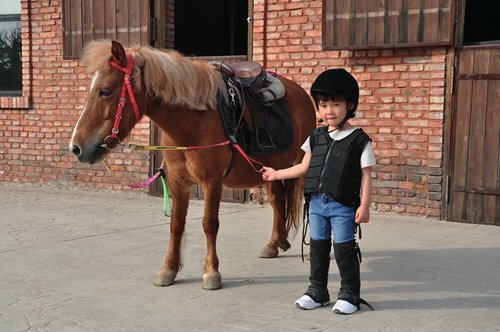 Currently, more than 66 percent of the equestrian club members in China are small children and teenagers, Chen said. Lü Jianhui, the CEO of Ipony International Youth Cavaliers Academy has an optimistic outlook on the equestrian market for children in China. "In 2014, when we started to establish our club, children and teenagers had already made up the majority in the Chinese market, but no program was tailored for this group," he said. He explained that one of the reasons there are more kids than adults learning the sport is that small children and teens have more spare time to learn. "Over the years, we have seen increasing enthusiasm from the market. More and more children are joining, and upper-middle-class families are acknowledging its benefits for children," Lü said, adding that he believes kids and teens will be a major driving force in the development of the sector. Aside from the warming market, Chen said currently, the percentage of equestrian enthusiasts in China is very low compared to European nations and that coaches in the country are not well trained. "Therefore, the issue we are facing is how to expand the number of enthusiasts while making the industry more professional," he said.